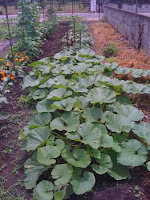 Hard as it may be to believe I've been lucky enough to have a garden here in Tokyo. Shortly after starting to work at a local organic farm I was offered gardening space. It's not huge, but it's lovely and I've been so incredibly happy to be able to have it. I've only written a bit about the garden now and again, but now that the winter vegetables are nearly all in I thought I would share some of the photo highlights. 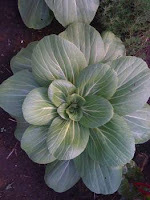 We grew bok choi (pictured above), beets, a number of herbs, edible and non-edible flowers, long beans, eggplant, cherry tomatoes, three kinds of kale, radishes, spicy peppers, what turned out to be ornamental strawberries, swiss chard, American pumpkin, and long onions. Some worked out better than others, of course. The American Pumpkin (pictured at left) didn't make it. Perhaps the Tokyo summer with its high heat and humidity proved too much or it was a case of powdery mildew. Either way, despite its fantastic good looks - vines that stretched from the bed to the edge of the garden and then over the compost pile nearly to the chestnut grove - it didn't set fruit and died. Most of the herbs did tremendously well. We've got a ton of pesto in the freezer, and I'm still drying others. The mint and lemon balm are attempting a take over of one of the beds, but so far I've held my own against them. I knew better than to let them loose, but I had spring fever and so in they went. To our delight, the fennel attracted what looked like Monarch caterpillars and we let them munch all they wanted. The farmers said they turned into a large black butterfly, although I don't know which one. Later, the blossoms attracted a bevy of bees and other pollinators. I never knew who I would find buzzing about and bedecked with pollen. Our tomatoes and eggplants thrived for the most part, and despite a recent typhoon battering the tomatoes are still offering up fruit. (I just ate a couple gold gems tonight while checking on seedlings and trying to spot cabbage worms on the kale.) The Green Zebras don't seem to be thrilled, but they went in a little late. We've gotten a few fruits that we've enjoyed immensely. The farmers are still skeptical of a green tomato, but if any tomato can bring them around it's Green Zebra. And if not, more for us! The kale (all three varieties) did well, and I believe it will make it through the winter. That's been a taste of home we delight in every day thanks to the help of a good friend. It, too, was not impressed with the high heat and humidity of a Tokyo summer and struggled through July and August a bit. Then the cabbage worms came a-snackin', and so it goes. Now that it's turning cooler, the plants are starting to look a bit more like themselves again. 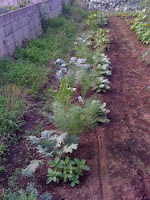 Our garden sits in the southwest corner of the farm where a walking street runs. People regularly stop to admire the flowers and vegetables, and are often surprised to see two foreigners working away in the beds. Our Japanese is not so hot, but it doesn't matter. We smile and offer a just-picked tomato or flower, and the smile we get in return is communication enough. It's been a pleasure. 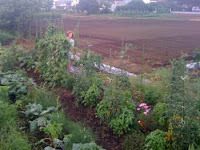 The photo at left shows me picking some beans and the garden in August. Behind me is are fields now filled with carrots, daikon, and broccoli. The edge of the chestnut grove is just visible in the top left corner. Behind me are two beds that have recently been bequeathed to me for growing space. 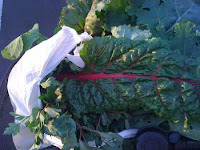 (It's now planted in garlic, daikon, mitsuna, mustard, arugula, beets, onions, cabbage, and broccoli and covered with a tent.) We've also tidied up the space along the wall (third photo down) and prepped it for herbs, flowers, and maybe even strawberries. The toad living there wasn't thrilled at first, but we think he'll like the remodeling. 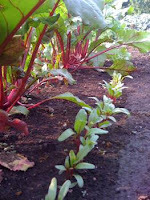 I can't believe how many crops - in the farm and in the garden - have been planted and harvested and planted again. The sweet potatoes I helped plant this spring are going to be harvested by pre-schoolers this Saturday, and the third round of broccoli is coming along nicely. I can hardly believe I get to plant winter vegetables, and I have no idea what to expect - as usual. But I'm excited to see what will happen and so grateful for this garden. Hi Joan, It's so inspiring to see all your adventures in gardening this summer. And all in your first year in Tokyo! I'm very happy for you.